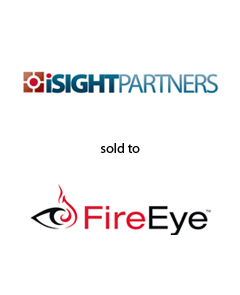 AGC Partners is pleased to announce that its client, iSIGHT Partners, a global provider of cyber threat intelligence, has been acquired by FireEye. This acquisition adds deeply differentiated global threat intelligence to FireEye’s leading security platform, significantly enhancing FireEye’s ability to detect, prevent, and mitigate advanced threats quickly and efficiently. With a team led by Maria Lewis Kussmaul, AGC Partners acted as co-advisor to iSIGHT Partners.